Whilst the nation rejoices in the success of Team GB, we are in mourning, for one of Humphrey's hats has gone over to the other side. And yes, the other side may be the council fabric recycling bag, but it is a loss Humphrey feels keenly. For those who have met Humphrey will know, he is always to be seen in a hat. In the winter, he chooses to adopt the Smurf look, occasionally tending towards French beret when worn at a jaunty angle. In the summer, he models a range of sun hats in various shades of grime, from off-white to khaki. From the fisherman's hat to the floppy-brimmed cricket hat, all are to be found protecting Humphrey's bald pate from the ferocious sunshine for which the Cote d'Horkesley is known. 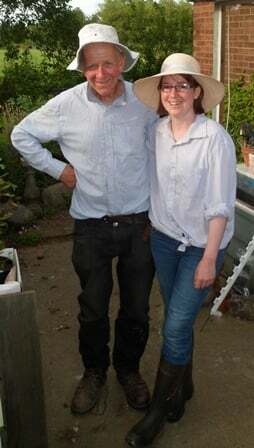 And whilst Hannah may despair, and cruelly wrest these hats from him or behind the tractor seat or scattered around the farm (life is a catwalk), to make them moderately sanitary, the millinery parade marches on. Some even say it runs in the family. And so to the passing of the hat. It's demise came when it entered the washing machine and the oil, diesel and dust holding it together were lost. Seen here in better times, the international stardom years on Google Streetview. And so, it is with sadness in my heart, and a rapidly disintegrating sunhat in my hand that I sign off this blog post. RIP sunhat. You've gone to a better place.